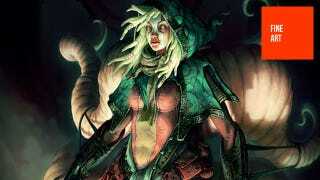 Markus Neidel is a German concept artist who most recently worked on Black Prophecy, a sci-fi MMO. You won't find too much sci-fi in this gallery, though. What you will find for the most part are some epic fantasy images that look so delicious you'd be forgiven for thinking you could slice them off your screen, put them on a plate next to some fancy cheese and then enjoy every damn bite.